The Gospel of Matthew, although it is only twenty-eight chapters long, is a very important book. In fact, Genesis and Matthew are the two key books of the Bible. 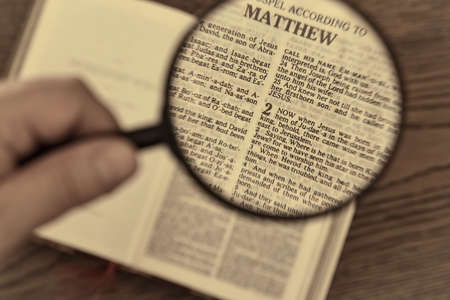 As we come today to the Gospel of Matthew, I'd like to bridge the gap between the Old Testament and the New Testament because, in order to appreciate and to have a right understanding of the New Testament, it is almost essential to know something about this period between the two Testaments. There was a time of silence between the Old Testament and the New Testament. Then one day the angel of the Lord broke in upon the time of prayer when there was a priest by the name of Zacharias standing at the altar in Jerusalem. The angel gave the announcement of the birth of John the Baptist who was the forerunner of the Lord Jesus. We shall see later how important John the Baptist is in the Gospel of Matthew. As we come to the time period that Saint Matthew writes about, we see that the Medo Persian empire and Egypt faded from the scene as outstanding nations. World power shifted from the East to the West, from the Orient to the Occident, from Asia to Europe, and from Medo-Persia to Greece. When the New Testament opens, a new power, Rome, is the world ruler. In about 63 B.C. Pompey, the Roman, took Jerusalem, and the people of Israel passed under the ruler-ship of a new world power They were under Roman government at the time of the birth of Jesus and through out the birth of Jesus and through out the period of the New Testament. in 40 B.C. The roman senate appointed Herod to be king of Judea. There never has been a family or man more wicked than this. Once can talk about the terrible Mafia, but this family would exceed them all. In 37 B.C. Herod took Jerusalem and slew Antigonus, the last of the Maccabean king-priests. In 31 B.C. Caesar Augustus became emperor of Rome. Then in 19 B.C. The construction of the Herodian temple was begun. The building had been going on quite awhile when our Lord was born and was still continuing during the time of the New Testament. Then in 4 B.C. we find that Our Lord Jesus was born in Bethlehem. radical changes took place in the internal life of the nation of Judea because of their experiences during the time between the Old Testament and the New. After the Babylonian Captivity, they turned from idolatry to a frantic striving for legal holiness. The law became an idol to them. The classic Hebrew gave way to the Aramaic in their everyday speech, although the Hebrew was retained for their synagogues. The synagogue seems to have come into existence after the captivity. It became the center of their life in Judea and everywhere else they went in the world. Also, there arose among theses people a group of parties which are mentioned in the New Testament and are never even heard of in the Old Testament. 1. PHARISEES-The Pharisees were the dominant party. They arose to defend the Jewish way of life against all foreign influences. They were strict legalists who believed in the Old Testament. They were nationalists in politics and wanted to restore the kingdom to the line of David. So they were a religious political party. Today we would call them fundamentalist theologically speaking and to the far right politically. 2. SADDUCEES-The Sadducees were made up of the wealthy and socially-minded who wanted to get rid of tradition. the Sadducees were liberal in their theology, and they rejected the supernatural. Because of this they were opposed to the Pharisees. They were attempting to attain the "good life." They thought they could overcome their bodily appetites by satisfying them, that by giving them unbridled reign, they would no longer need attention. In our day, a great many folk have this same philosophy. It did not work the past; neither will it work today. 3. SCRIBES-The scribes were a group of professional expounders of the law, stemming back from the days of Ezra. They became the hair-splitters. They were more concerned with the letter of the Law than with the spirit of the Law. When Herod called in the scribes and asked where Jesus was to be born, they knew it was to be in Bethlehem. You would think that they would have hitched hike a ride on the back of the camels to go down to Bethlehem to see Him, but they weren't interested. They were absorbed in the letter of the Law. Brothers and Sisters, there is a danger of just wanting the information and the knowledge from the Canonical Law, the Scriptures and the Fathers of the Church, but failing to translate it into shoe leather, not letting it become part of our lives. Through study we can learn all the rules and regulations of the Church, we can study and learn all the basic facts of the Bible, we can cross every "t" in theology and Truth and dot every "I" in the doctrines that the Church upholds, without allowing that knowledge to take possesion of our hearts. The scribes fell into such a category. In our own day, I must confess that some of the most hard hearted people I meet are the Pharisees and and Scribes of the Church today, the Traditionalist. Not all of them, but those who, when they say they want to return to tradition they are talking about the small "t"s traditions, the 1940s and 50s Catholic culture not primarily the big "T" traditions. They are more concerned about a celibacy priesthood then they are about hard hearted Priest who's only desire, is to do just what is reqired and nothing more for their people. They are more concerned about a person praying all the mysteries of the rosary in one day then they are in having a spirit of prayer all day long. Such Christians are like an ape who sits around all day long picking bugs off of other apes ignoring the fact that they have there own bugs that need tending to. These kind of traditionalist and Canon lawyers want to rip people apart in order to maintain some little point. It is important to know what the Church desires of us, it is important and laudable to attain all we can about the scriptures. But we must also translate it into our life...it must get into our hearts. Then and only then we can pass it on to others. If done any other way, the world only sees the Hypocrite, the Pharisees the Scribes, when our desire is for them to see Jesus working with in us.